Recently relocated to just a few blocks from the Bishop Arts District, La Carreta’s empanadas are flaky and light, stuffed with savory, spicy ground beef with hard-boiled egg and olives, spinach and ricotta, and Roquefort and ham. At only $2 an empanada (or a dozen for $20), the empanadas alone are enough for us. 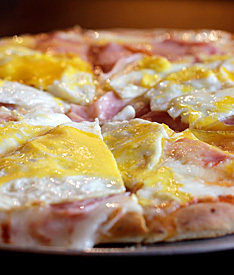 The Argentina pizza, however, with its mozzarella, ham, and fried eggs—so perfectly cooked that the yolks oozed a little without drenching the pie—might be one of our favorites in Dallas.